Work by Zdeněk Sýkora from the retrospective exhibition "Barva a Prostor" ("Color and Space"), Muzeum umění Olomouc, 2010. 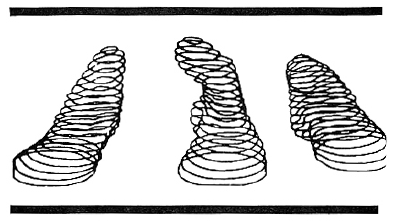 In 1964, Sykora collaborated with mathematician Jaroslav Blazek to create visual computer-aided structures which used algorithms to find different combinations of abstract elements within predefined parameters. The result echoed the aesthetics of Op Art, yet his methods were his own. Then around 1973 he abandoned structural work and began to make paintings characterized by clusters of interwoven lines. These lines - everything from their hue, length, thickness, curve, direction—were determined by a computer program that mixed equal parts randomness and precise mathematics. Here is a video (in Czech) featuring a tour of a retrospective exhibition at the Museum of Modern Art in Olomouc, Czech Republic. Whilst there is a focus on the artist's paintings you can clearly see some of the computer-designed sculptures around. Zdeněk Sýkora's website; original post from PK. Quad II, 1968. 711⁄2 x 11 in. TRAN2 computer sculpture in laminated veneer. Quad IV (1970). Laminated slabs of computer-determined marble. 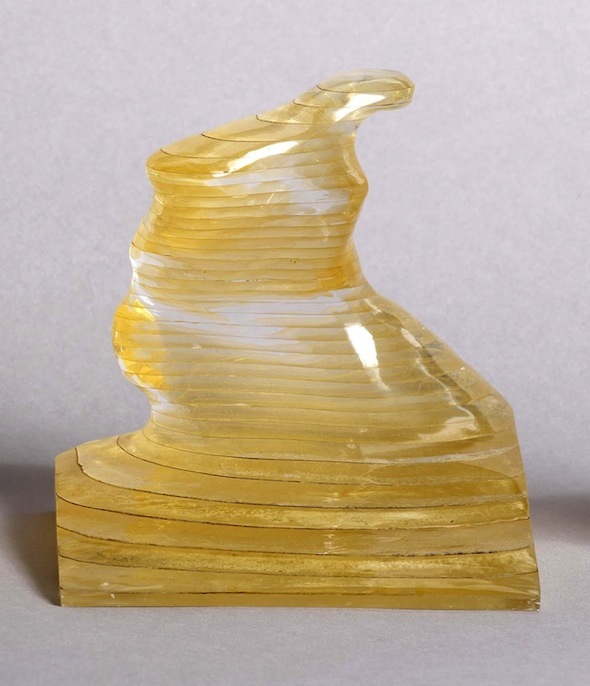 American artist Robert Mallary developed a computer program that could be used to design three dimensional forms by stacking two dimensional shapes, a process not so dissimilar from some 3D-printing approaches today. How/why did you become involved with the computer in producing art? ...I turned to the computer in 1967 on learning for the first time about its ability to generate and transform images. Almost immediately I realized that my earlier idea of multi-planar image synthesis could be used to describe three-dimensional forms within the computer by slicing and stacking them as two-dimensional shapes—something like a contour map. 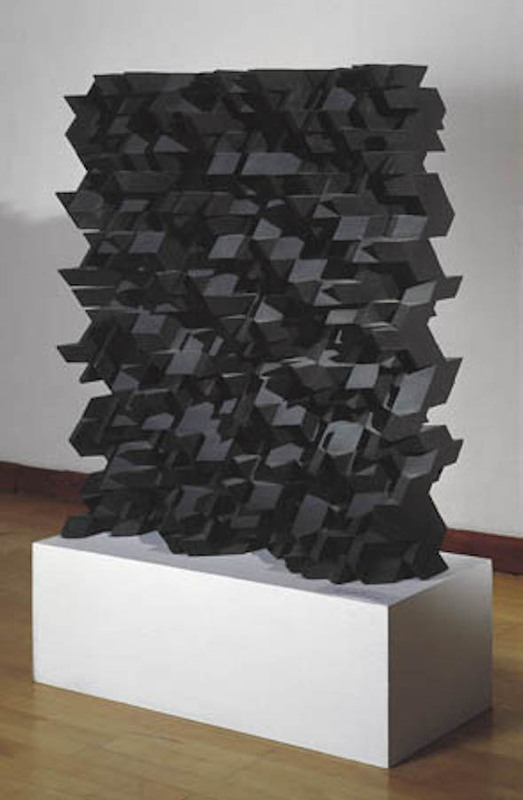 The result was my computer sculpture program TRAN2, the first version of which was written in 1968 for the IBM 1130 system at Amherst College. Below is an extract from "Computer Sculpture: Six Levels of Cybernetics", a piece written by the artist for Artforum in May 1979. TRAN2, the computer sculpture program which has occupied me and my student associates for the last eighteen months or so, is still at the crawling stage in terms of programming and hardware sophistication, but even at that it has opened up several possibilities for sculpture which were not available in the past. It can also be said in its favor that it embodies, even if only in skeletal form, the essential requirements of an authentic computer sculpture program. It provides several modes of data input; it gives the computer a full, three-dimensional description of the material it must work with; it provides ways to process, modify and reshape the form description input material; and it provides several kinds of graphic output usable for evaluating the computer’s productions and for physically constructing an actual sculpture if the drawings are sufficiently promising. 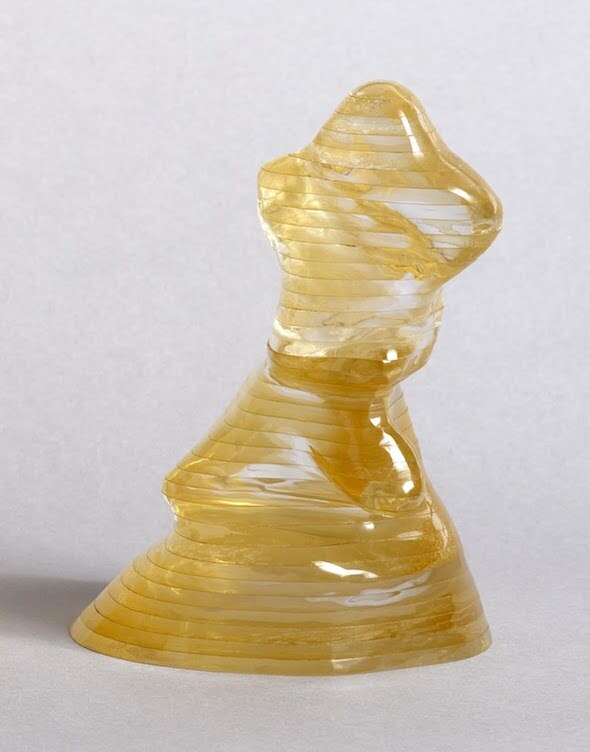 If a computer is to make sculpture, it must be given either a comprehensive numerical description of the basic material it is to work with, or the means to generate this material for itself. In fact, our TRAN2 program does both, using contour “slicing” as the basic method of form description and form generation. In effect, the form is sliced—much as an apple or a chunk of baloney might be sliced—into a series of thin cross sections of equal thickness which can then be graphed, digitized and encoded on computer punch cards. It is also essential that each of the slices has an axis point to position it relative to all the other slices on the vertical axis. It is by means of this “stacking” of two-dimensional data that the program converts standard computer graphic capabilities to the requirements of three-dimensional form description. TRAN2 uses between forty-eight and a hundred contours. This is not enough for a smooth, continuous definition of the form (i.e., without a visible demarcation, or “step,” between one contour and the next), but it is a practical minimum considering the limited capacity of the Amherst College IBM 1130 computer for which TRAN2 is programmed. 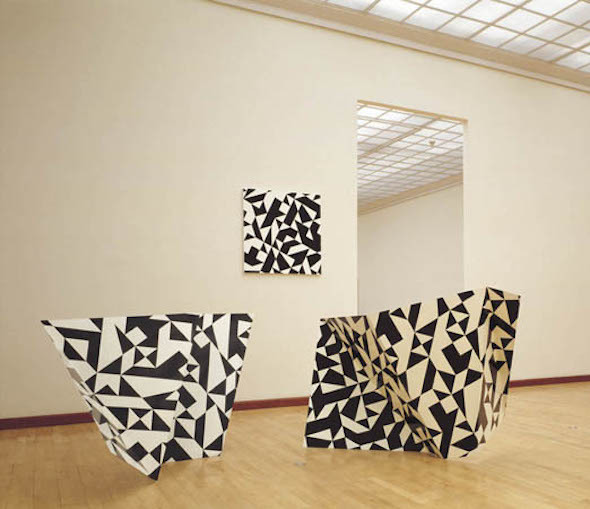 Seek is an installation by artist Nicholas Negroponte in collaboration with the Marchitecture Machine Group, originally debuting at the "Software" exhibition (1970) at the Jewish Museum in New York. 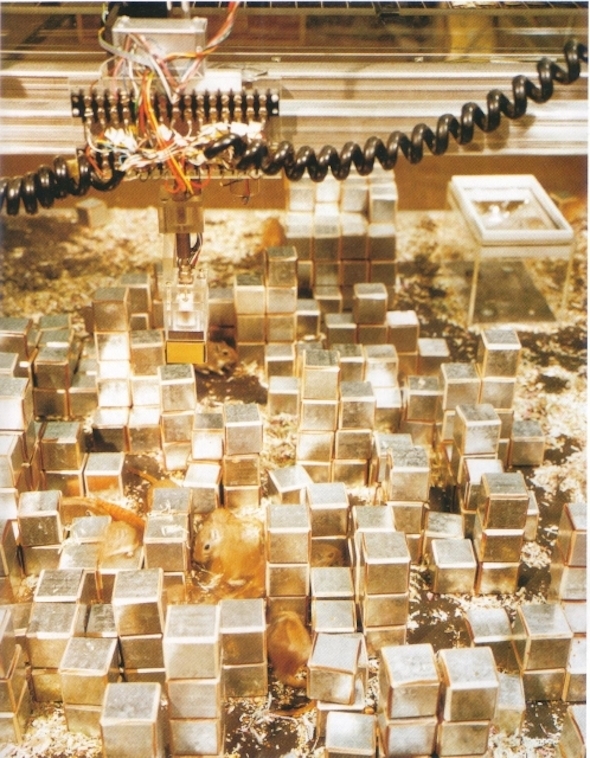 The installation consists of several gerbils inhabiting an enclosed space filled with blocks that are arranged and rearranged by a robotic arm. As the computer manipulates the environment, in a sense, the piecee becomes a sort of Minecraft for rodents. Seek is a sensing / affecting device controlled by a small general purpose computer. In contrast to an input/output-peripheral, Seek is a mechanism that senses the physical environment, affects that environment, and in turn, attempts to handle local unexpected events within the environment. Seek deals with toy blocks which it can stack, align and sort. At the same time, these blocks form the built environment for a small colony of gerbils which live within Seek's three-dimensional world. Unbeknownst to Seek, the little animals are bumping into blocks, disrupting constructions, and toppling towers. The result is a substantial mismatch between the three-dimensional reality and the computed remembrances which reside in the memory of Seek 's computer. Seek's role is to deal with these inconsistencies. In the process, Seek exhibits inklings of a responsive behavior inasmuch as the actions of the gerbils are not predictable and the reactions of Seek purposefully correct or amplify gerbil-provoked dislocations. A PDF of the Software catalogue can be found here. Other photographs can be found here. Original post from PK. Below is a computer generated plotter sketch for several sculptures, found in the August 1977 edition of Computer Graphics and Art (more on that here). Here is a video showcasing many works by the artist; more works can be found at the Museo Reina Sofía website here. The problem was how to build an ellipsoid, but an actual replica of a chicken egg on a grand scale… Fortunately, Resch had already been creating and experimenting with the modular tiling of general surfaces in 3D with a view toward architectural applications… Resch chose to build the egg out of flat aluminum plates. The question then was how to design a pattern of triangles that could be fabricated and connected together to achieve the egg's shape, decorative pattern, and structure, while still preserving his constraint of modular tiling…The program of Resch and Christiansen just specified some variable for the folding, and it simulated whatever surface resulted from the rigid polygon mesh. The result was the first physical structure designed with computer-aided geometric modeling software. Grün-orange-graues Hyperbolo "El Salvador," 1980. 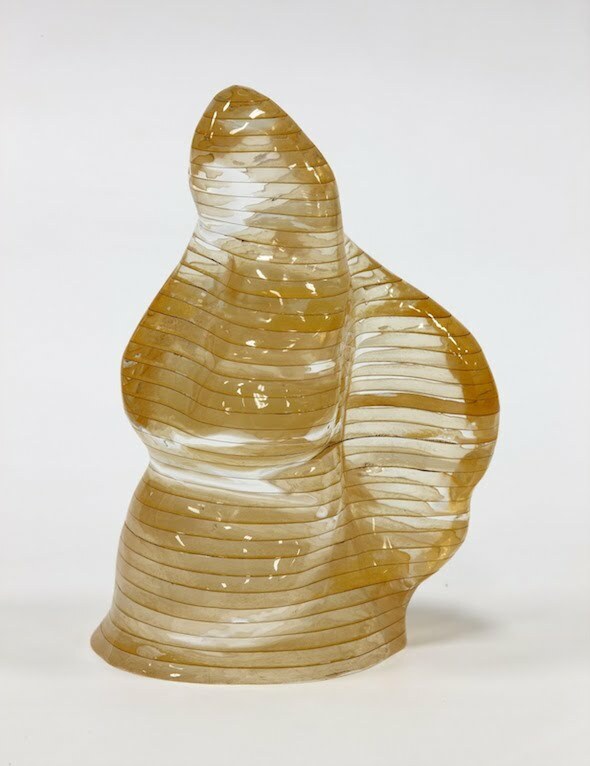 Now featured as part of a major touring retrospective opening soon at the Dallas Museum of Art, Isa Genzken's early work included a series of wooden sculptures produced with the aid of the computer. 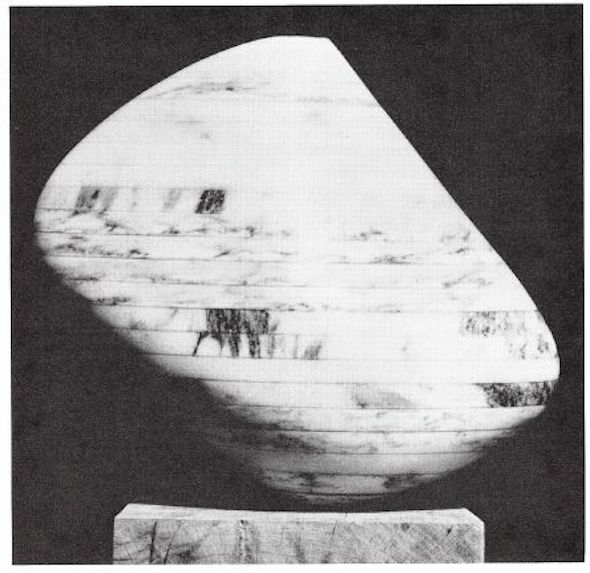 Her 1976 wooden sculpture (Ellipse No. 1) was shown alongside a computer plotter drawing in which two curved lines were drawn in a spear shape. 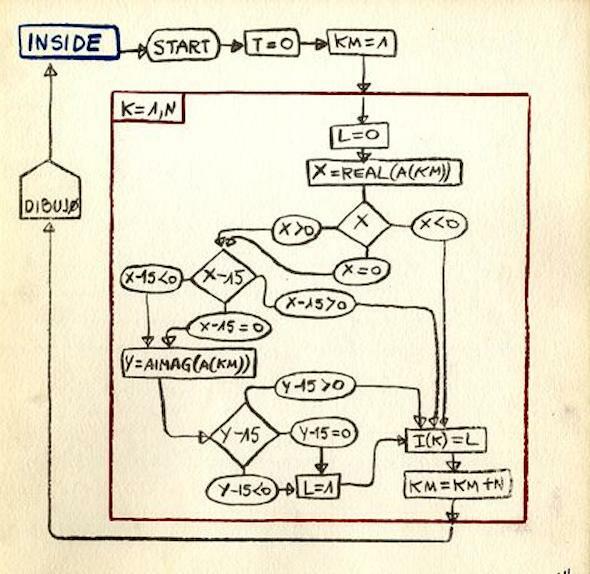 Computerzeichnung (Computer Drawing) (1976). Dot-matrix printout on continuous paper, 14 3⁄4 × 172 7/16" (lost). 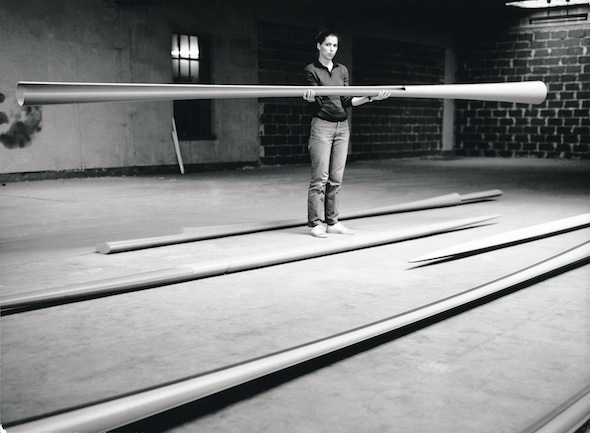 A letter dated October 4, 1979, in which Genzken again explained that she wanted to "call on" her engineer friend's "arts of calculation" in order to create mathematically correct sculptures, provides a glimpse into the production process that followed the technical drawing. 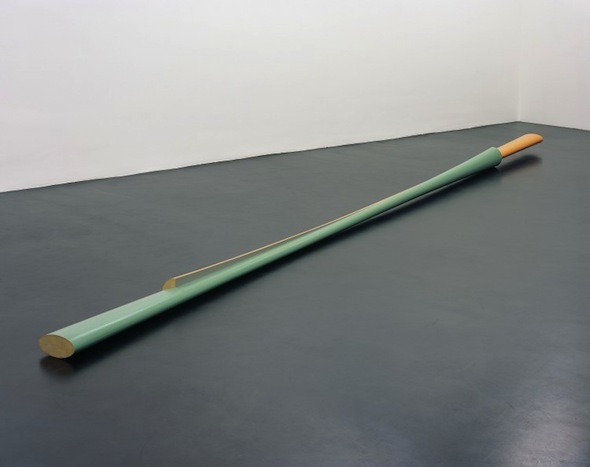 On the computer printout, which represented the sculpture at actual scale, for example, Krotz entered longitudinal and cross-sectional dimensions every ten centimeters. Genzken then trans- formed these into small wooden molds that corresponded to negative forms of the sculpture segments, which, in combination, illustrated the curve. In Hermann Hertel, the cabinetmaker at the Düsseldorf Academy, Genzken found the crucial third person, a woodworking specialist who could help her to realize her sculptures (fig. 13). He would first glue up a rough wooden shape in the maximum dimensions of the desired form and then remove what was necessary, constantly checking against Genzken’s negative templates. Once the final shape was achieved, it was painted in different colors and textures in an equally complex process in which Genzken again collaborated with a specialist. For more about "Isa Genzken: Retrospective," see this conversation by Hannah Black and Tyler Coburn for Rhizome. You can purchase Isa Genzken: Retrospective here.